Last night we battled the torrential downpours and decided to go to Jackson's Bistro on Harbour Island for dinner. 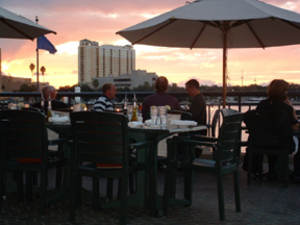 Jackson's, which opened almost a decade ago, is located in the heart of downtown, on the water. We camped out at the outside bar and deck to watch the Gasparilla "invasion" earlier this year (it was the first time I've been to Gasparilla) and I thought the view was great. For those of you not from Tampa, Gasparilla is the city's own smaller and tamer version of Mardi Gras. There's parades, a pirate invasion, music, food, drinks, etc. We hadn't been back to Jackson's since Gasparilla and thought it was worth giving the restaurant part of the place a try (Jackson's also had an attached bar area with annoying club music blaring). For our starter, we had the seafood strudel, which was essentially two flaky pastries stuffed with seafood and lobster cream in a plate drizzled with a tangy sauce. Neat execution and worth trying. For dinner, I had the sauteed lump crab cakes and Traci had the oak grilled chicken on focaccia toast (fancy chicken sandwich). My crab cakes were a nice size, had good flavor to them, weren't dried out and weren't heavy on the bread crumbs (a crab cake cardinal sin!). A winner in my book. I tried a bite of the chicken, which was good as well. Our funny observation of the night is that Jackson's is probably the first and only restaurant we'll ever go to that prominently has olive oil and vinegar on the table as well as an extensive sushi menu. The two just don't mix. I like my share of sushi and I'm sure Jackson's does a nice job in this area (they have an extensive sushi menu and the restaurant seems to cater to groups, which sushi is good for), I just think the "bistro, bar & sushi" is sort of an odd mix. Guess I'm old fashioned. Anyways, we enjoyed our meal and can now confirm that not only does Jackson's have excellent waterfront views and a great deck area for Gasparilla, but good food to match. Bottom-line: Good food, great views (when's there not pouring rain!) in a stylish setting. Also a good base camp for watching the Gasparilla pirate invasion each year.